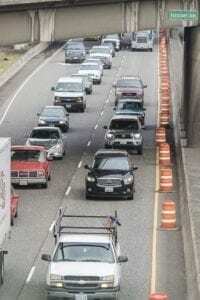 VANCOUVER — Vancouver City Council members didn’t plan to talk about Oregon’s idea of tolling freeways in Portland during their Monday evening meeting. 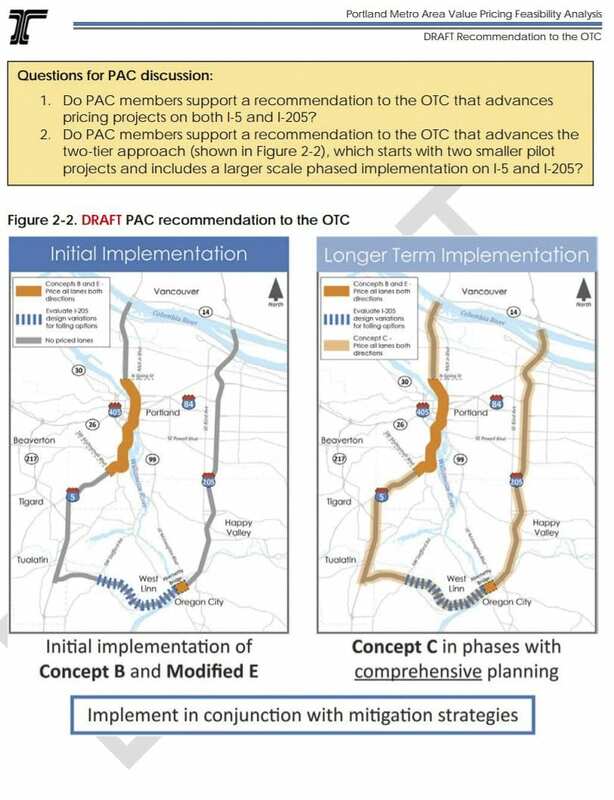 But, 90 minutes before council was set to meet, the Value Pricing Public Advisory Committee (PAC), led by the Oregon Department of Transportation (ODOT), released the draft of their final recommendation. Since Vancouver Mayor Anne McEnerney-Ogle is one of three Southwest Washington representatives on the 25-member advisory committee, the council is involved in crafting the city’s response to the recommendations made by ODOT. Since they weren’t set to meet again before next Monday’s final meeting of the PAC, staff had to scramble to read through the 91-page document and put together a report for the council. 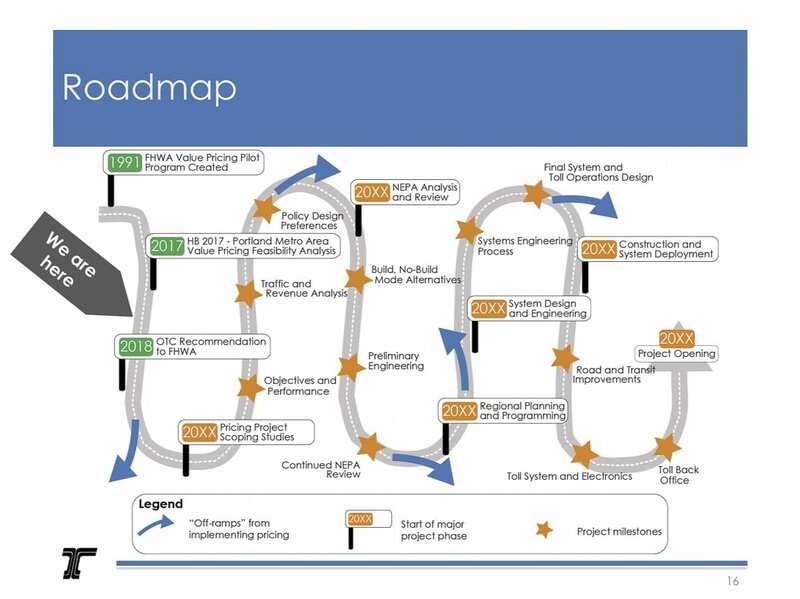 At their meeting in May, staff appeared ready to push ahead with implementing tolls only on I-5 between Going Street and Multnomah Boulevard, and then eventually phasing in tolls on the Abernathy Bridge on I-205 in Oregon City if the initial rollout went well. In Monday’s draft report, staff appear to be recommending a pilot program that would implement tolls both on that stretch of I-5, as well as the Abernathy Bridge. 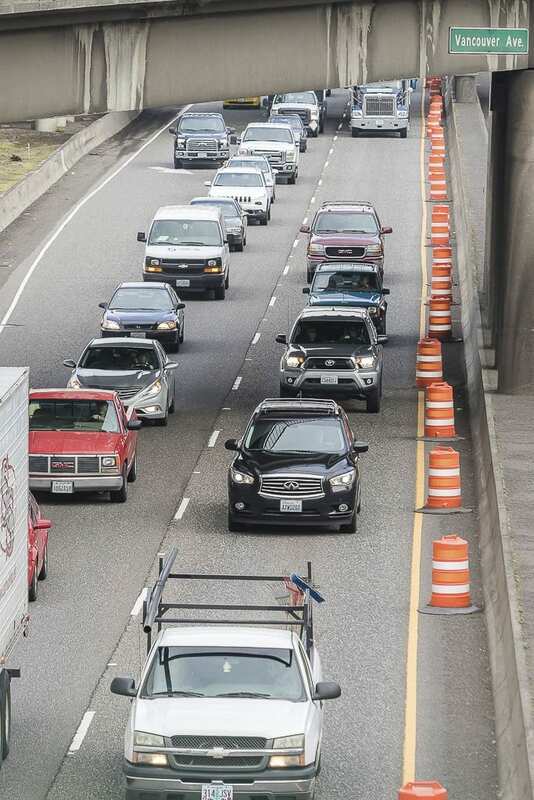 Tolling revenue generated there would pay for added new premium lanes on I-205 between 99E and Stafford Road. The report also recommends that further study be done regarding potential tolls on other Portland-area highways, including US-26, Highway 217, and I-84. They are also not ruling out eventually rolling tolls out to all lanes of I-5 and I-205 between the Columbia River and Tualatin. The draft report did seem to at least pay lip service to more cooperation with areas outside of Portland impacted by the potential tolls. One of the questions asked was whether PAC members felt revenue from tolling should be used to help alleviate congestion in the region, either through added traffic capacity or increased mass transit options. That was one point the council hit on several times, indicating that Southwest Washington members of the committee should continue to hammer on the inclusion of an eventual Interstate Bridge replacement as a key component of Oregon’s strategy to implement tolling. Councilor Bart Hansen said they needed to be careful in phrasing their response to the questions, to avoid sounding like they’re agreeing too readily. The draft also indicates an openness to seeking out options to mitigate tolling for vulnerable populations that may include Clark County residents. Earlier ODOT had indicated that people who lived outside of Oregon likely wouldn’t qualify for any programs targeted and low-income commuters. “These mitigation statements are vague, in that they’re not identifying specific concepts and specific places, because that full study hasn’t taken place yet,” explained Kennedy. The key word the council believed was missing from much of the draft report is “bi-state,” rather than simply saying “area” or “region.” That, they believe, would more strongly indicate that Oregon transportation officials need to work in tandem with Clark County officials to address the transportation needs of the freeway system that connects Portland and Vancouver. Mayor McEnerny-Ogle believes that conversation also needs to include C-TRAN. “Considering we are the only freeway transit system in the entire metro it should be in here somewhere,” said the mayor. The Value Pricing Public Advisory Committee meets for the final time Mon., June 25. The results of that meeting will go to the Oregon Transportation Commission on July 12. They will draft a proposal to submit to Federal highway officials by the end of the year. That is expected to kick off a multi-year National Environmental Protection Agency study, which could fundamentally change the outcome of the plan.